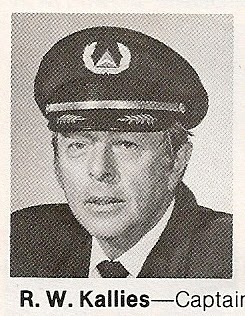 News has been received with the passing of Delta Pioneer & Delta Golden Wings member retired DL pilot Captain Robert W. Kallies, age 84. Captain Kallies joined Delta Air Lines 07-09-1956 and retired at the mandatory age 60. He was based Chicago for much of his career, then Miami, and finally Atlanta at the time of his retirement. Former ORD Chief Pilot Capt. Robert William Kallies, Delta Pioneer and Golden Wings member passed away yesterday in Naples, Fl. He had hospitalized and passed away from medical complications. Capt. Kallies replaced Chief Pilot Capt. Jack Reeves at ORD later transferred to ATL. There are no arrangements to announce at this time.